Head to Melbourne Central and Melbourne Watch Companyfor plenty of shopping. Get in touch with nature at St. Kilda Beach and Melbourne Zoo. 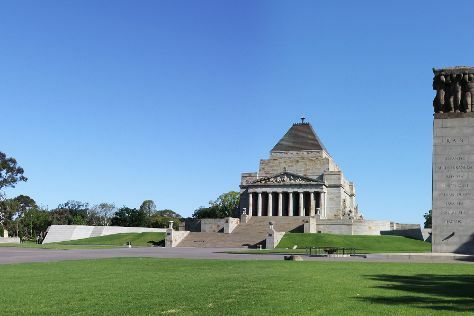 There's still lots to do: learn about all things military at Shrine of Remembrance, browse the different shops at Melbourne's GPO - Shopping Centre, contemplate the long history of Old Melbourne Gaol, and take in panoramic vistas at Eureka Skydeck 88. To find ratings, where to stay, other places to visit, and more tourist information, read Melbourne trip planner. Sydney to Melbourne is an approximately 3.5-hour flight. You can also do a combination of flight and shuttle; or drive. Traveling from Sydney in December, plan for a bit cooler nights in Melbourne, with lows around 14°C. Wrap up your sightseeing on the 27th (Thu) to allow time to drive to Cowes. To see traveler tips, where to stay, and more tourist information, you can read our Cowes trip maker website . Getting from Melbourne to Cowes by car takes about 2 hours. Other options: do a combination of train and bus; or do a combination of train and taxi. In December, daily temperatures in Cowes can reach 28°C, while at night they dip to 15°C. On the 27th (Thu), you'll travel to Portland. Portland is a city in Victoria, Australia, and is the oldest European settlement in the state. On the 28th (Fri), enjoy the sea views from Cape Nelson lighthouse, take a peaceful walk through Petrified Forest and Blowholes, and then don't miss a visit to Cape Bridgewater Seal Walk. To see photos, more things to do, other places to visit, and more tourist information, read Portland tour site . Use the Route module to find suitable travel options from Cowes to Portland. Traveling from Cowes in December, you can expect nighttime temperatures to be slightly colder in Portland, with lows of 11°C. On the 29th (Sat), wrap the sightseeing up by early afternoon so you can travel back home.